Recently, at the suggestion of the Sasquatch, I changed my hit counter to one from the fine folks at StatCounter.com. Now, I can see just where folks are coming from when they visit my blog. It's kinda fun to see how people end up on my doorstep. And sometimes, it's a little disturbing. A lot of folks land here by virtue of Blogger's "next blog" feature. That explains the people who show up here via such delightful places as "hot-tub-babes.blogspot.com" and "wrongful-death-information.blogspot.com." My, my, my. There sure are a whole lot of really weird commercial sites out there. Most of the people who reach the Church of the Big Sky via "next blog" stay here a total of 0 seconds. Zero. And just like that, they're off to more pleasant lands and fertile imaginations. 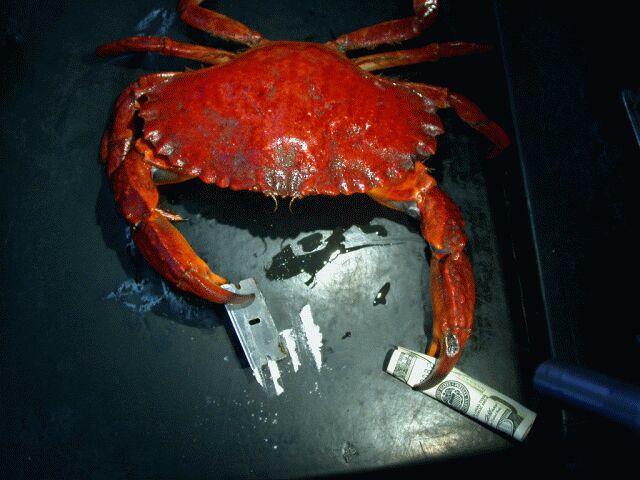 Clearly, this crab is still stuck in the Gordon Gekko/"Greed is good"/Jay McInerney/"Bright Lights, Big City" 1980's. Somebody call Crockett and Tubbs! Yeah, the World Wide Web is one messed up place. But I guess it's good to know there's space enough for me and the hot-tub-babes. God bless the Internet and all who sail on her. I've been meaning to say hello, especially since the Sasquatch recently figured out that I was a certain domain you had both been noticing on your counters. I'll officially de-lurk to say that I'm enjoying your writing and while I'm rooting for you to find a job asap, I do appreciate that you post throughout the day! Oh, Crud... so, you now know how often I drop by? It's so sad, that you now know, that I have no life... not that you haven't suspected such for quite some time. PS: In my defense, you do write often and it is easy to miss stuff.